Mystery Monday: Just Who Are the Coyne’s? Patrick Dolan didn’t know it but he left me one of the biggest genealogy gifts a researcher could ever ask for. He died in San Francisco two years before the earthquake and fire. Patrick owned property and had some money saved up when he passed away. His niece, Mary (Kelly) Meincke, was designated as adminstratix. His will was still being processed when the earthquake struck. All remnants of the paperwork disintegrated along with Mary’s home–as well as the files at the Court House. In 1907, Mary started proceedings to have the will reinstated. This involved a process when the people involved (not the deceased, of course) had to prove that a will had in fact been in process prior to being destroyed. The Judge approved Mary’s request. Everything was going smoothly until notices were published in newspapers back in Boston, MA, where Patrick Dolan had first lived when he came over from Ireland. Three cousins came forward claiming that they were the rightful heirs to Patrick Dolan’s estate. They were Mary Collis, Bridget (Coyne) Wall, and Thomas Coyne. Another nephew, Patrick Coyne, is mentioned, but he did not contest the will. There was something curious about this trio from the start. Patrick’s obituary listed the children of his sister, Catherine (Dolan) Kelly, and two Dolan nephews living in San Francisco, who I have yet to connect to the tree. The two Dolan nephews did not contest the will and were not part of the proceedings from what I can tell. But, there was no mention of anyone on the East Coast. So, who were these people? The contested will left some clues but nearly enough to solve this mystery. In the end, the court ruled that everyone but Mary Collis had a stake in Patrick Dolan’s estate. Mary Collis was proved to be the illegitimate child of Patrick’s sister, Bridget Dolan. She had no rights to the estate. Bridget (Coyne) Wall and Thomas Coyne were declared rightful heirs. They were the children of Patrick’s sister, Margaret (Dolan) Coyne. I’ve done considerable work trying to locate information about Bridget Dolan and Margaret (Dolan) Coyne. Much to my chagrin, I’ve come up empty. Researching Mary Collis has provided me with absolutely nothing. As I have no idea what part of Massachusetts she was from, I haven’t been able to establish any information about her. Searches for birth, marriage, and death records have turned up nothing. It’s slightly confusing because I do not know if Collis was her maiden name or married name. I do not know if her Mother married or not. This brings up to the Coyne. I’ve been quite successful searching Bridget (Coyne) Wall and Thomas Coyne. I have Thomas’ death certificate, Bridget’s marriage index entry, and census entries for Bridget and family from 1900 to 1930. It’s 1880 and earlier that everything goes wrong. I have searched and searched for their parents Margaret (Dolan) and Patrick Coyne. I’ve come up with absolutely nothing. It is as if they gave birth to a few kids in secrecy and dumped them in the public square when they were adults so that they could start their own lives. Another researcher helped with Bridget. She believed that Bridget was living with a Coyne family in Milford, Worcester Co., MA in 1860. The parents were not Patrick and Margaret, but Thomas and Mary. This Bridget is listed as their child. I’m not really sure what to do next. I’m not that familiar with Massachusetts research. I have been going through the birth, death, and marriage records at familysearch.org. I’ve found a couple of items of interest, but not that big fat “A HA!” that I need. What evidence do I have? This gives her parents as Patrick Coyne and Bridget Dolan. Her Mother’s name is wrong. Is it and error, or was her Mother really Bridget? Interestingly, it shows Michael Wall as being from Dorcester, but Bridget Coyne is from Roxbury. 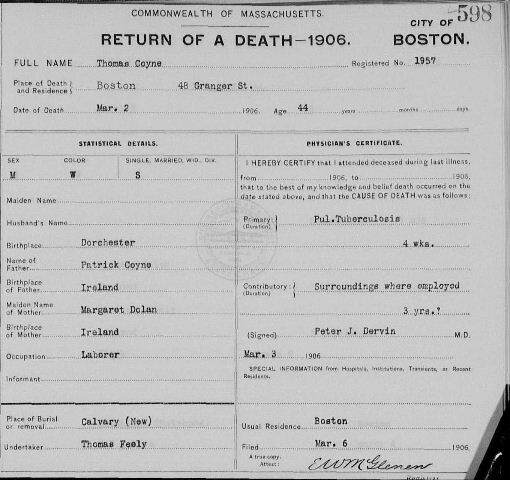 Thomas’ death certificate does list his parents as Patrick Coyne and Margaret Dolan. His death certificates notes that he was born in Dorchester (part of Boston), so not even close to Milford. The address given as Thomas’ last residence is that of Bridget (Coyne) Wall. I did not find them living together in 1900. Perhaps Thomas moved in after that census. 3. 1880 Census for Patrick Coyne. There is an entry for a man named Patrick Coyne who has a son, Thomas Coyne, in the 1880 census. It’s a possibility. But, if it’s the family I am looking for, what became of the other son, Patrick Jr.? I have been able to find records for Martin and Catherine (Kelly) Dolan and Patrick and Mary (Kelley) Dolan in the birth and marriage records for Roxbury, Boston, MA. So, I know that they, in fact, lived in the area. So, where are the two sisters? What happened to Margaret and Bridget? Why can’t I locate anything on them? A part of me thinks that maybe Bridget, Thomas, and Patrick Coyne aren’t related to my tree. Could, Bridget at least, be the real daughter of Thomas and Mary Coyne of Milford? Could she have see the notice in the newspaper of Patrick Dolan’s passing and then fudged some records, got some people to be her witness, and successfully shown herself to be Patrick’s niece when she really wasn’t? Or, is the Milford connection a wrong path? Maybe Patrick and Margaret (Dolan) Coyne lived elsewhere. Perhaps they did not get to the Worcester area until the 1860s when Thomas Coyne was born. And, maybe they both died sometime between Thomas’ birth and the 1870 Census. This would explain why I can’t find any records on them. If anyone has any helpful tips on how I might find out who the Coyne’s really are, I am all ears. I’d love to know that they connect to the tree by way of Patrick’s sister just like they said they do. But, I’d sure like to find primary proof of that connection. And, I’d sure like to know what happened to Patrick and Margaret! It’s disconcerting when people just fall off the face of the earth. Hopefully, one day, I will move this family from the mystery file to the solved file. Are These the Dolans I’ve Been Looking For? What a Week for Genealogy! My Grandfather was Patrick Coyne from County Cork. His wife was Betsy DeHart of french origin. Together they had 12 children of which my Mother one one. He worked for the City of Chicago in the 1800’s. Would love learn more about the Coynes. My grandfather was Patrick Coyne from County Cork. He married Betsy DeHart of French origin. Together they had 8 children one was my Mother. He worked for the City of Chicago in the 1800’s. I believe they lived in Missouri and Illinois. I would love to learn more about the Coyne’s. My grandfather Patrick Coyne, really not sure where born but County Cork kept coming up. He and my grandmother Betsy DeHart had 2 sons named Patrick, one died in child birth and the second died on Iwo Jima during the second world war. They had one other son John. Their daughters were Sally, Hazel, Mary, Margaret, Patsy, and Kathryn. Two city names that comes up are they lived in Ringwood, Illinois and Geneva, Illinois. Are they any relationship to the tree you are building? Hi Martha, as yet I don’t have a link to Illinois. If you find your Coyne’s came through Massachusetts, then we might have a link.